20 Applications for Artificial Intelligence in Ecommerce [2019 Edition] - Ignite Ltd.
Ecommerce is on its way to grossing $700 billion by 2022. The use of artificial intelligence in ecommerce is proving helping to pave the way to ecom sites that are safe, easy to use, and profitable. In this article, we look at how to use AI in ecommerce. The applications we will discuss can benefit existing online stores as much as new ones. One could argue that chatbots have been chatted about enough. These self-serve user interfaces have appeared everywhere from the websites of insurance companies to mobile apps for pizza delivery. The problem is, consumers have come, chatted, and kicked chatbots to the curb. The decision-tree logic that drives most chatbots provides stock answers to common questions. When a user goes off the beaten path, as they often do, rules-based chatbots don’t respond well, causing users to quickly lose patience. Using deep learning and natural language processing (NLP), AI chatbots do more than give rote replies. They give thoughtful answers. AI chatbots engage the ecommerce customer 24/7. The intelligent answers they provide result in more sales and happier customers. AI is already demonstrating its writing talent in automated content creation. The same writing skills that help AI to generate business content for fintech can benefit ecommerce, as well. Ecommerce platforms live and die by product descriptions. Regardless of the product image, if the description skimps on details, would-be customers move on. But writing descriptions for the ever-increasing inventory of products is laboursome and costly. AI solves the problem by automating the process of writing descriptions for products. AI can do more than copy product information from the manufacturer’s site. It can scour the Internet to find the most recent and most relevant details about the products an ecommerce store offers. Since AI can see what details are most often included in keywords, AI content software knows just the right details to include to the hype that wi-fi-enabled food processor. The descriptions it produces contain the exact information buyers are looking for. AI might not make the New York Times Best Sellers List any time soon, but writing product descriptions is definitely on its resume. Advanced thinkers like Elon Musk and the late Stephen Hawking have warned that AI may one day enslave all of humanity, or worse. Until then, it’s doing a really good job making product recommendations. Ecommerce giant Amazon.com reports that upselling and cross-selling is responsible for 35% of its total annual revenue. No doubt, Amazon’s AI-powered real time product recommendation engine is the secret sauce. Artificial intelligence is perfectly suited to recommending products to ecommerce customers. Thanks to its ties to big data, AI knows about a customer’s purchase history, search inquiries, even lifestyle changes that can affect purchasing choices. Smart recommendations are transforming how ecommerce sites serve their customers. 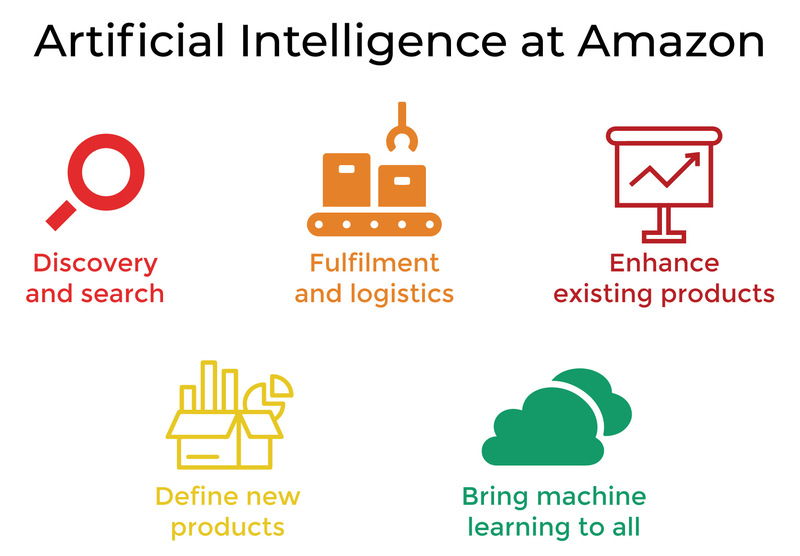 With giants like Amazon and eBay investing in AI, it’s time every ecommerce operator gave it a look. Product searches are at the heart of every online store. But converting search terms into sales takes more than a database query. To maximize sales, search engines must help customers find what they want, even when they are not sure what that might be. AI-powered searches are different from conventional database query engines. The most important difference is the ability of AI to learn about the customer. What was the last item they purchased? What do their browsing patterns tell about their needs and wants? What does their social media footprint say about what they like and dislike? Since AI can pull information from big data, it can know more than simply the search terms they enter. Since AI can use deep learning, it learns from its interaction with the customer. These search results not only reflect what a customer asked for, but other things they might need. The power of AI to help customers find what more of what they need makes it a no-brainer for any platform. The growing IoT global infrastructure makes it difficult to leave the Internet of Things out of any conversation where technology is concerned. Ecommerce is no different. Although IoT and ecommerce technologies might not be married yet, the time has come for them to at least shake hands. The value IoT offers ecommerce may not be obvious, but it is undeniable. Consider the increasing number of IoT devices in our lives. Appliances, wearable IoT devices, virtual assistants, and connected cars are but a short list of Internet-connected items that we surround ourselves with. Now, consider further what these items know about us. Get them talking to ecommerce sites, and who knows what they will say. Your driving habits, your heart rate, and the contents of your smart refrigerator all are knowable by your IoT network. All of these can speak volumes to what you might like to purchase. As ecommerce sites increasingly turn to big data, your devices will help let them know what they can sell you. As IoT becomes more commonplace, so, too, will the transfer of data from these devices to the websites we visit. The growth of artificial intelligence in ecommerce has extended from the website to the warehouse. The modern warehouse is void of forklifts and clipboard-bearing stock managers. Rather, it is populated by AI robots that whiz about, storing and retrieving stock items 24/7 without so much as a lunch break to slow them down. Automated warehouse robots do have one thing in common with their human counterparts of yesteryear: they like to talk. But rather than wasting time at the water cooler, these faithful workers talk to the AI warehouse management software. As soon as a customer makes a purchase, a robot can be dispatched to take the purchased items out of stock, to box them, and have them ready to ship. Smart robots can do everything but drive the delivery truck. On second thought, they can do that too. Automated warehouse software completely disrupts the venerable warehouse industry. That’s bad news for the forklift driver, but very good news for the ecommerce site owner. AI isn’t ready to replace conventional cybersecurity solutions, but it has a helping hand to lend. The threat to ecommerce platforms and the customer data they store has never been greater. By incorporating AI and deep learning into security solutions, platforms can keep criminals out and customer data in. AI and deep learning enable cybersecurity solutions to spot “outliers” in network traffic, which can foretell of an attempted intrusion. While conventional security protocols and algorithms must still do the heavy lifting, AI’s sensitivity to these minute irregularities can help protect ecommerce platforms from attack. Data breaches are not somebody else’s problem. If you run an ecommerce platform, sooner or later they will become your problem. The best defense is a robust security solution, augmented by AI. It’s no secret that the level of service a customer receives after the sale is almost as important as pre-sale support. The problem is, many ecommerce providers do not know how to serve customers once the sale is completed. AI customer service solutions not only take care of the customer before and during the purchase, but after the sale. As with most AI application, big data comes into play. Since intelligent software knows the customer’s behavior on and off the store platform, it can serve their needs better than most human reps.
To be fair, AI wasn’t always great at human interaction. But significant advances in natural language processing (NLP) and deep learning has AI well-qualified to take care of your customers before, during, and after the sale. Keeping enough stock to meet demand, without having too much stock sitting idle, is the mark of good inventory management. Using AI for ecommerce inventory control is a great way to accomplish it. The problem with conventional inventory management software is that it is basically dumb. It can show you what’s in the warehouse, and where it is, but that is about all. Oh, sure, you can print out all the charts and graphs you want, but those do little to help you intelligently manage your stock. AI warehouse management tools also know what’s in stock and what’s not. More importantly, it knows precisely what you need to reorder and precisely when. Of course, inventory management software powered by AI knows how many widgets you have. But it also knows how many you will need tomorrow. 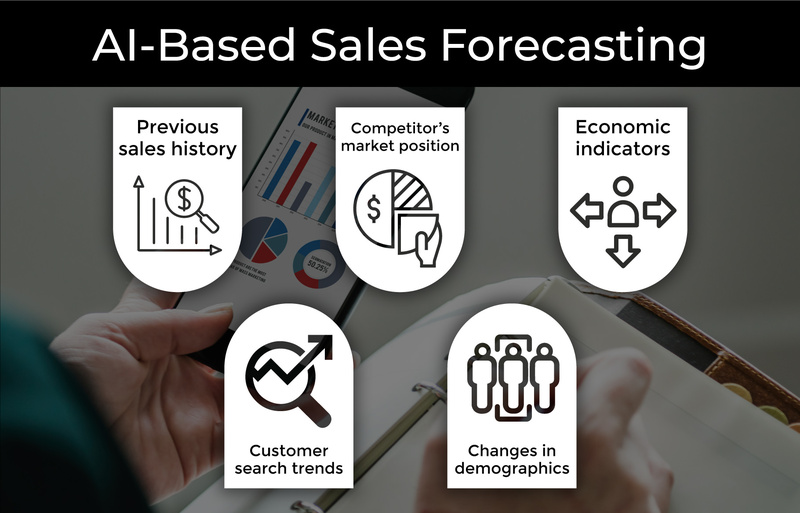 Sales forecasting helps companies to set sales goals, allocate resources, and to manage supply chains efficiently. Till recently, predicting sales has been a mix of art and science, and getting it anywhere near right took a lot of time. AI is keen on predicting outcomes, making it the perfect disrupter for ecommerce sales forecasting. AI can even use weather forecasts and other real-time data to help predict short-term sales volumes. One of the most recent benefits of artificial intelligence in ecommerce is the ability to process images. Why this is valuable to ecommerce operators lies in how customers search for products. As we have seen, AI takes keyword searches to a whole new level. But customers also like to search by images. Take, for example, a customer who is looking for a particular halter top. She saw it on someone else, liked it, and now she wants one, too. She can’t quite describe it, but she would know it if she saw it. As the customer examines product images on the ecommerce site, AI will examine her. By analyzing which images she hones in on, how long she looks at them, and related behaviors, AI can identify what she might be looking for. Through its own inventory search, image search software can suggest tops that might be just what the customer is looking for — before she gives up and moves on. The tech behind smart image searches is based in neuroscience. Deep Neural Networks and deep learning enable AI to “see” images the way we do. A prime example of intelligent image searches is Pinterest. Now imagine that same technology helping you find that dress you saw once. The online shopping public is increasingly impatient and increasingly visual. By offering smart image search features on your ecommerce website, you can show them what they want, even when they are not quite sure what it is. Ecommerce platforms churn through enough data in a single minute to choke a horse or at least a web server. Keeping customer profiles, purchase details, and other information moving freely taxes conventional database software, but not AI. AI-based data management does not have to organize raw data before it can use it. In fact, things work better when it doesn’t. Using data lakes, AI can leave ecommerce platform data in the raw and unstructured until it is acted upon. But data has to be structured to be used efficiently, right? Not with AI. By keeping images, product descriptions, and customer data in raw form, AI saves time since it does not have to sort through data structures when using data for different applications. As ecommerce platforms continue to grow, keeping data raw will be crucial to keeping it fast. Making raw data useable will be the job of AI. Email marketing is not dead, though we sometimes wish it were. It is not that we mind receiving emails about products, it’s receiving emails about products we are not interested in that annoys us. AI gives email marketing new life by helping campaigns to be more targeted and customized for the recipient. As often happens, the discussion of AI involves big data. Email marketing powered by artificial intelligence can pull data from social media posts, public records, and other sources in order to learn about the customer. And the better AI knows your customer, the more effective your email campaigns will be. The power of AI in ecommerce marketing can help you know your customer better than ever. A successful ecommerce operation involves more than a website and an online store. It requires a well-managed supply chain. If your store shows “out of stock” for too many items, your customers will simply click on over to your competitor’s site. Not all ecommerce platforms have supply chains. 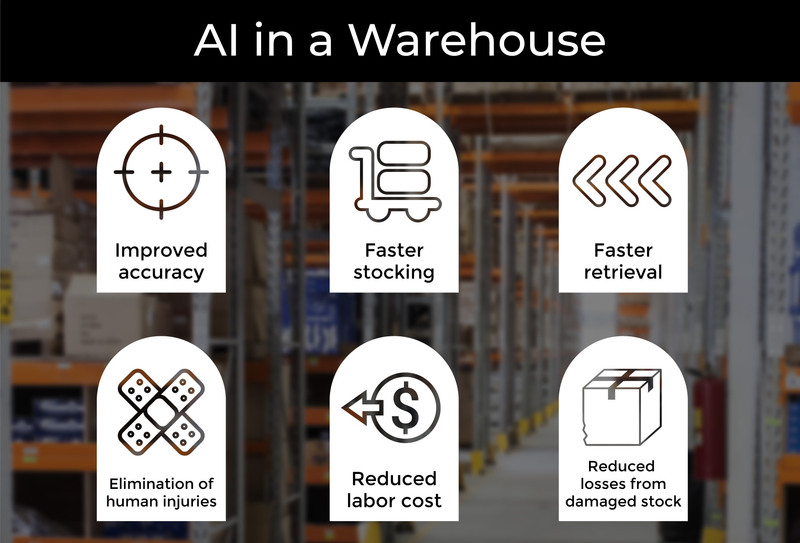 For those that do ship their own products, AI brings tremendous value to the process of getting products to the warehouse. While the online storefront remains the most important part of the ecommerce platform, an efficient and reliable supply chain is necessary to keep it running. AI keeps product delivery on time and surprise-free. An ecommerce business is more than its online store. Believe it or not, behind the website is a real business, with employees, computers, and office processes. Just like with any business, keeping the office running smoothing can be as important as making sales. AI technology can benefit the office side of ecommerce as much as it can the online store. Many companies have already invested in Robotic Process Automation (RPA), with $5 billion expected to be spent in 2020. The face of ecommerce might be the website store, but the brain is increasingly AI. Pricing optimization, also called dynamic pricing, is another valuable way AI maximizes ecommerce sales and profits. AI automatically sets the highest price a given customer is likely to accept and still buy the product. Prices presented to one customer may differ from what is shown to another, or from what is shown to the same customer at a different time. Deep learning allows AI to make an informed hunch on what you are willing to pay for that hotel room or set of aluminum tumblers. And chances are it knows before you do. In a sense, the role of artificial intelligence in ecommerce is all about analytics. The power of AI to provide predictive analysis can be a boon to any business, including ecommerce. We have discussed some specific applications of AI for the “ecom” industry, now let’s take a broader perspective. In business, information is power. And AI business intelligence gives you about as much power as you can handle. Not only is the public becoming more visual, it is also becoming more verbal. The desire to enter text is just not as exciting as it used to be. Today, customers increasingly want to talk to their devices, and that includes websites. Mobile speech recognition apps for ecommerce will be the norm at some point in the future. Rather than a text-based interface, there is no reason customers can’t tell the online store what they want. Speech recognition has been around for years. With AI, customers can converse with ecommerce sites, taking the shopping experience to a whole new level. Checkout is one of the most important functions of an ecommerce site. Sadly, some great sites offer such poor payment experiences that frustrated customers leave with items still in the cart. Whether mobile wallet or online cart, AI can make your payment portal customer-friendly. First, there were online products. Then came product reviews. Then came fake product reviews and the credibility of reviews fell through the floor. Still, people read them. And true or not, reviews do affect buying decisions. Many ecommerce sites allow customers to offer product reviews, but not many have safeguards to prevent fake reviews from being posted. The prevalence of fake reviews hurts the ecommerce site, its vendors, and its customers. A study by Cornell University proved something you probably wondered but were afraid to ask: AI knows when you are lying. The study indicated that AI detected fraudulent reviews with an accuracy of 90%. Thanks to AI, now ecommerce sites can help protect the validity of one of their most valuable sales tools, the product review. Artificial intelligence online shopping offers ecommerce a wealth of benefits offered by no other technology. The ecommerce boom may be happening, but if you want your ecom business site to boom, you need more than a website, you need one that can think for itself. Ignite specializes in delivering custom solutions for clients around the globe. Whether you need an artificial intelligence ecommerce platform, AI app, or back-office AI solutions, we’ve got you covered. With six R&D sites across Europe, we are strategically located to serve you, no matter where you are.